Hello, my name is Karl and I’m the newest member of the Golfbreaks.ie team. I’ve always had an interest in golf and travel. I am an avid golfer and I look forward to dealing with other golfers helping to plan enjoyable and memorable holidays in the future. As I am new to this, it was important for me to get to know the areas where we provide golf and accommodation, one of the most popular being the Algarve in Portugal. As the cold season months have been fast approaching there is no better time to start planning your ‘get out of the cold’ golfing holiday. Armed with all the information I am about to give you it will be a much easier sell, and that perhaps a holiday in the Algarve is exactly what you are looking for. 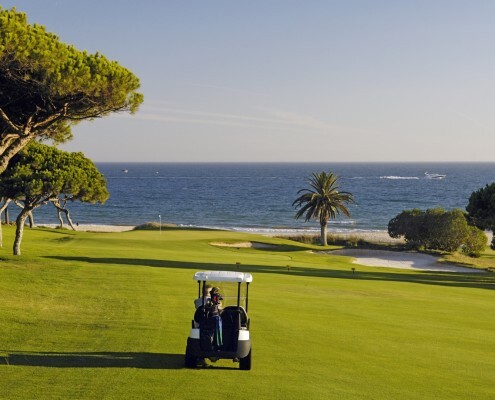 The following destinations have everything from sun, sea, restaurants, a buzzing nightlife and most importantly – some of the best golf courses that Portugal has to offer. I landed in Faro airport approximately 10.30 am to a mild 16oC, keep in mind this is the 29th of November. After a very scenic 40-50 minute drive I arrived in the beautiful town of Lagos. This historic city is located along the western coast of the Algarve. Tivoli Lagos Hotel was the first stop on my very busy 3-day schedule. An ideally located hotel right in the middle of things in Lagos, ‘listen up non-golfers’, is equipped with the best indoor pool, jacuzzi, saunas and steam rooms. Everything you need to keep you occupied during the day, while the golfers play a few holes. 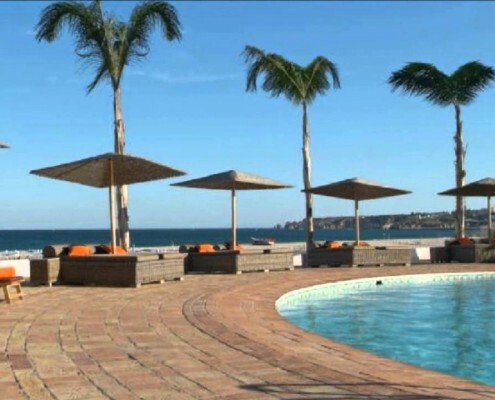 Another lovely options are the very modern Vila Gale Lagos Hotel, which boasts the best amenities a hotel can offer and also the fantastic Marina Club Lagos Resort which gives you a preferential rate on the local Palmares Golf Course. Espiche Golf Course, set within the undulating countryside is a course for golfers of all levels. Winner of the ‘clubhouse of the year 2016’ it is the most unique that I’ve ever seen. Offering a 360o view of the surrounding course it is the perfect place to relax with a drink after a guilt free round. Boavista Golf Course was the next on my list. The friendly atmosphere and luxurious surroundings makes for an ideal place for groups looking to stay on a golfing resort. The final course I visited was Onyria Palmares Golf Course. 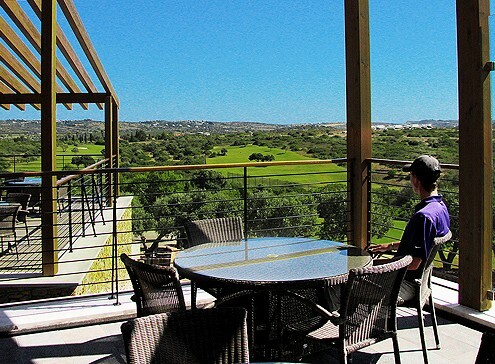 The clubhouse located at the top of the golfing complex offers a great view of the 27-hole championship course and the surrounding coastline. A place where you can enjoy a delicious lunch (I recommend the golfers grill). It is no surprise that this was voted the top 3 golf courses in Portugal by Golfdigest magazine. The next location on my trip was Alvor, where you are spoilt for choice in terms of both accommodation and golf courses. Two of the most popular I visited were the Pestana Dom Joao and the Pestana Alvor Atlántico Hotels. Located close to the beach with easy access via the boardwalk which stretches 5km along the coastline. The hotels in this area are in affiliation with the local Pestana Golf Courses (Pinta, Gramacho, Silves and Alto) and offer great value deals on accommodation, golf and Spa packages. We then moved onto one of the nicest hotels I’ve ever been in! 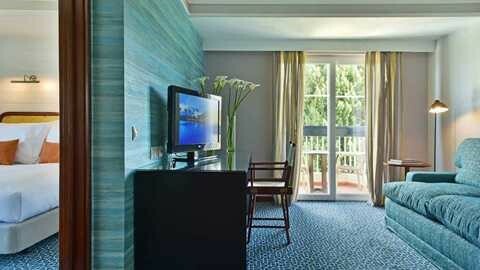 The 5* Pestana Alvor Praia Hotel is situated on the most privileged place in Alvor overlooking the entire beach. After its recent refurbishment, its modern suites and top of the range facilities are exactly what you expect from a 5* hotel such as this. So, there you go, now that I have laid most of the ground work for you, you should have no problem getting a golfing holiday in this year which everyone can enjoy, it may even become a yearly tradition.